Fund for Active Citizenship (FAKT) traditionally awarded best annual philanthropy practices in 2017 on December 8th, at Royal Theater "Zetski dom" in Cetinje. Fund for Active Citizenship (FAKT) traditionally awarded best annual philanthropy practices in 2017 on December 8th, at Royal Theater “Zetski dom” in Cetinje. The ceremony honored outstanding philanthropic achievements, recognizing and paying tribute to the individuals, businesses, institutions, diaspora and non-profit organizations whose contributions improve the quality of our lives, our communities, and our country. The winner of this year’s Award for Contribution at National level is CEROVO doo from Bar, a socially responsible company that earned ISKRA 5 years ago a contribution to the local community! CEROVO is an example of a company that performs a common good in continuity; it strategically conceives and develops its approach, and by the power of its influence and credibility, it involves more and more actors; and thus serves as an example to others. Many other activities and donations in money and goods/services. This year’s winner of the Award for Diaspora Contribution is CULTURAL CENTER “RUMIJA” from Chicago, one of the most organized Montenegrin association in North America. The Center was established in 1995 as a non-profit organization, with the aim of preserving and nurturing the customs and traditions of their homeland, helping to each other and providing humanitarian assistance to people in distress. There are numerous humanitarian activities of “Rumija”: for help to the Hospital in Bar, for the treatment of socially vulnerable, for construction of rural roads, for financial support for the electrification, renovation of the school and sports hall in Mrkojevici village near Bar, for building a mosque, organization and financing of different cultural events in Chicago (celebrations of Independence Day and Statehood Day), and numerous other cultural activities. In the past year their philanthropic contribution has exceeded $ 186,000. 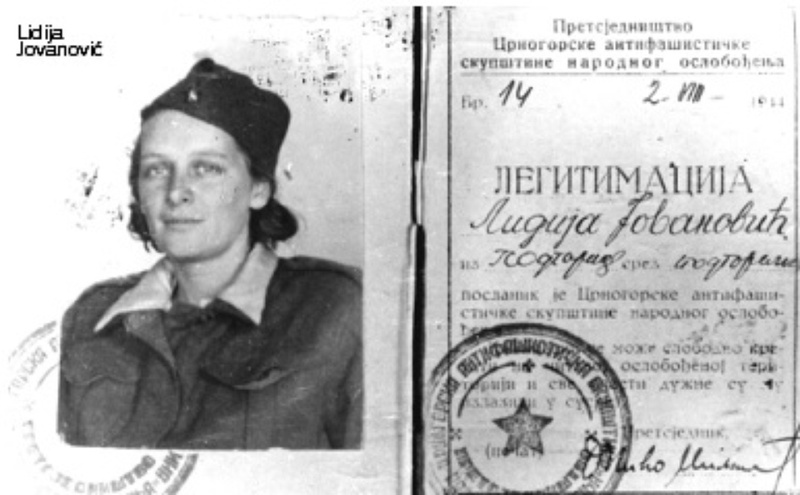 Lidija Jovanović was not only the carrier of the Partisan Acknowledgement, the founder of the Anti-Fascist Front of Women of Montenegro, a member of the Montenegrin Assembly…, but above all a great humanist who dedicated her life to the emancipation of women, care for war orphans, children with developmental disabilities and enlightenment of the youth. Former “first friend” of Montenegro, wife of Blazo Jovanovic, statesman, revolutionary, antifascist and first prime minister of Montenegro, was at the head of numerous humanitarian organizations such as the Red Aid and the Red Cross. Her name is related to the establishment of several residences for war orphans, a residence and school for children with hearing problems in Kotor, residence for children without parental care in Bijela, a residence for elderly people in Risan, the Association of the Blind Montenegro. Lidia’s life path will remain indelible in the anti-fascist vertical of Montenegro, it will serve generations as an example of humanity, the struggle for freedom and it will be forever remembered as a hub for a better and more solid society. SPECIAL RECOGNITION FOR CONTRIBUTION TO THE LOCAL COMMUNITY – NIKSICKI MLIN A.D.
Financial support for sports development: to basketball, soccer and handball clubs “Sutjeska”, judo club “Akademik”, chess club “Niksic”. Association “Euro Gusinje” from New York is recognized by numerous donor actions to help those in need, as well as for investing in infrastructure projects in the area of Plav and Gusinje (North East Montenegro). In 2017, the association collected $ 47,000 for the treatment of a young man, arround $ 30,000 for home construction and treatment of sick Sefketa Jarovic, while $ 19,000 has been collected for renovation of bridges at Alipasina’s springs (Gusinje). This year we have more than ever awards for contribution to the common good: even FOUR! And what connects them all is the power of will, communion, solidarity, volunteering and the mobilization of a large number of actors and citizens. Since its establishment in 2010, Banka hrane (the Food Bank) has organized numerous humanitarian actions for food and hygiene donations to a large number of families in a state of social need. In addition to the concrete support they provide according to the possibilities – because they are volunteering, they collect the food supplies through the donations of citizens and socially responsible companies. The Food Bank activists are investing their efforts in increasing the visibility of problems such as poverty and unemployment and their causes, and at the same time they point solidarity and humanity as desirable values in society. They show it through their work, including an increasing number of young people in their actions. The parental association “Fenix” was founded in 2013, in order to help children with cancer and their families with their experience and knowledge. In less than 4 years of existence, they organized over 10 humanitarian actions, during which they collected money for the treatment of sick children, including funds for renovation and adaptation of the Department of Hematology and Oncology at the Institute for Child Diseases in Podgorica. This project, worth 65,000 euros, was realized primarily thanks to the efforts of the Fenix association. We will mention only some of the fundraising actions: First humanitarian lottery within the children’s spring weekend, Humanitarian manifestation “Be Human Hair Show”, humanitarian concert of Art and Culture Society “St. Jovan Vladimir” from Bar, basketball fundraising game Buducnost – Igokea, as well as fundraising premiere of the film “Bojana pearl”… Through these fundraising events they succeeded to collect almost EUR 50,000. In the aforementioned charity event “BE HUMAN Hair Show” – on January 22 2017, organized by Fashion and Beauty Center “Zoran”, “Be Human” Foundation and Cultural Informative Center (KIC) “Budo Tomovic”, there has been collected EUR 10,265 for assistance to children with cancer (for NGO Fenix ​​Montenegro), that is, for renovation and adaptation of the Department of Hematology and Oncology at the Institute for Child Diseases in Podgorica. The Great Hall of the KIC was too small for everyone who wanted to participate and contribute! Spriritus movens of this action were Zoran Vukcevic and his team – and this action was one in a series of humanitarian activities in which Mr. Vukcevic participated, both in Montenegro and in the region. For this opportunity, we will highlight one more recent action: a hairstyle and makeup show, organized by the Association of Paraplegics of Montenegro and Fashion and Beauty Center Zoran, in which professional hairdressers and people with disabilities participated in order to promote equality and improve employability of person with disabilities – a real peformance that delighted all visitors. The elementary school “Njegos” is one of the educational institutions that stimulates philanthropy development, in the right way, through the process of learning about humankind, volunteerism, as well as developing empathy among the students. As stated in the nomination, “promoting the importance of all stakeholders in the school system to contribute to the spread of humanity, to develop awareness of philanthropy and the importance of implementing humanitarian actions, 57 school employees, together with their 592 pupils and their parents were involved in the story of humanity, during the entire school year 2016/17”. The children from the school parliament, the entrepreneurial club and various school sections, with the support of their parents and teachers, have designed and implemented a significant number of activities for the common good. Only in 2017, they have collected around EUR 5,000: EUR 2,500 in cash, food and hygiene during a large humanitarian action “Contribute, as well!”, and almost EUR 900 for the treatment of a sick student from this school. Other collected funds, from the Union of employees, bazaars and other humanitarian actions, exceed EUR 1,500. Special recognition for media contribution is given for an action which showed that Montenegrin society needs to rebuild the entire system of values, and that the media can have an unprecedented and enormous role in this. “SUPPORT, WIN” is a slogan that Montenegro will remember for a long time: the slogan of the first Montenegrin TELETON, which promoted communion and altruism. It was organized by six TV stations RTCG, Atlas, Vijesti, 777, Prva TV, PINK M, together with “Be Human” Foundation, with the aim of collecting funds for the treatment of children who are fighting with cancer. Almost 100 celebrities – actors, athletes, singers, journalists, as well as representatives of companies operating on the territory of Montenegro, gathered on February 15, 2017 with a common goal; during the four hours of Teleton itself, they received phone calls using 1511 donor phone line and talked with citizens who thus donated two euros per a phone call, as well as by sending sms. In just four hours, 367,374.00 euros were collected. Teleton is a historical TV project, and it was more than a TV show: it was preceded by a very intense campaign, which brought together a large number of media professionals around the noble goal, and they all united all of us – the citizens. ISKRA award ceremony is organized in partnership with the national Chamber of Commerce and the Directorate for Diaspora, and supported by a number of friends of ISKRA, as we call all those who believe in our mission and importance of philanthropy promotion and development. And they are many: from our strategic donors and supporters – the Charles Stewart Mott Foundation and the Rockefeller Brothers Fund, to Foundation “Cano Koprivica”, Adriatic Marinas – Porto Montenegro, Addiko bank, Lustica Development, Congress Travel, Mezon, TAKT production, restaurant “Konak”, and off course – Royal Theater “Zetski dom”. You can see more photos from this year’s ISKRA Award ceremony here here.